Total weight gain? I think I'm holding steady around 16-17 pounds. Finally eating healthy-ish the last two weeks helped a lot! Maternity clothes? I started this pregnancy down a size from the last one, but I am starting to fit into some of the clothes from when I was pregnant with Evie without them looking too frumpy. 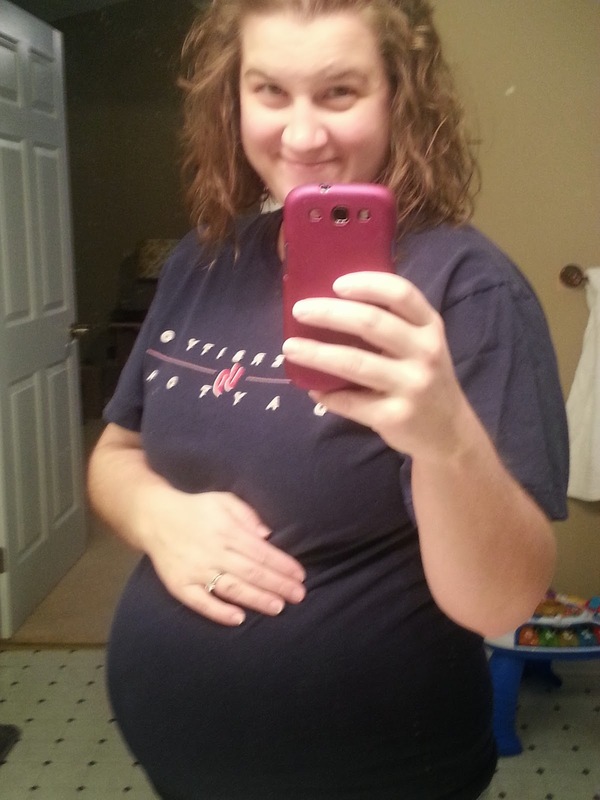 But on the downside, I don't really fit in any of my non-maternity clothes any more. I have my eye on this shirt that I might get, but we'll see. Stretch marks? Nothing new this pregnancy. Exercise. Really making an effort to walk, have dance parties with Evie, and even YouTube a few mini workouts. Thanks to everyone who friended me on FitBit - You're keeping me motivated to not be a lazy pregnant lady! Sleep. Back to an insomnia pattern, but Evie's napping better during the day so I can take little nap breaks. Movement. Out of control. I told Eric the other night I wish I could turn her off at bedtime. I feel like I'm getting head-butted in the pelvis. Ouch. But most of the time I love watching her kick, flip and swim. It's fun to see movement! Food cravings: Coke (what? 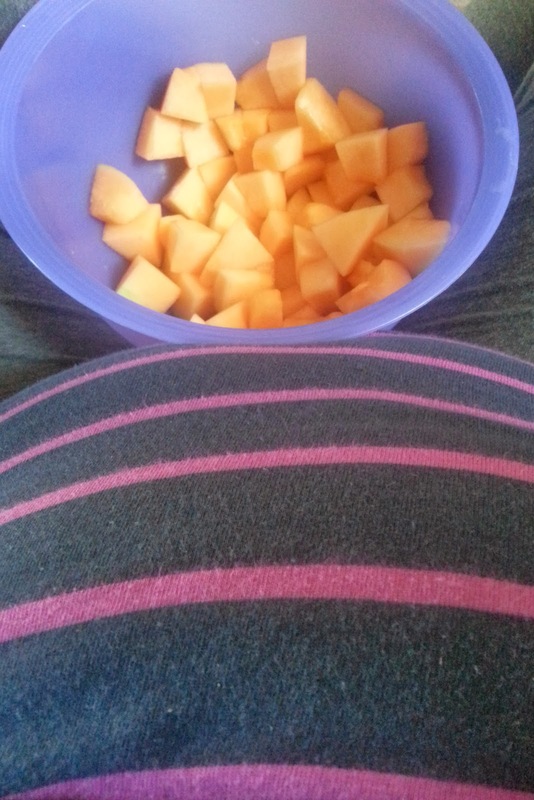 ), cantaloupe, clementines, and baby carrots. 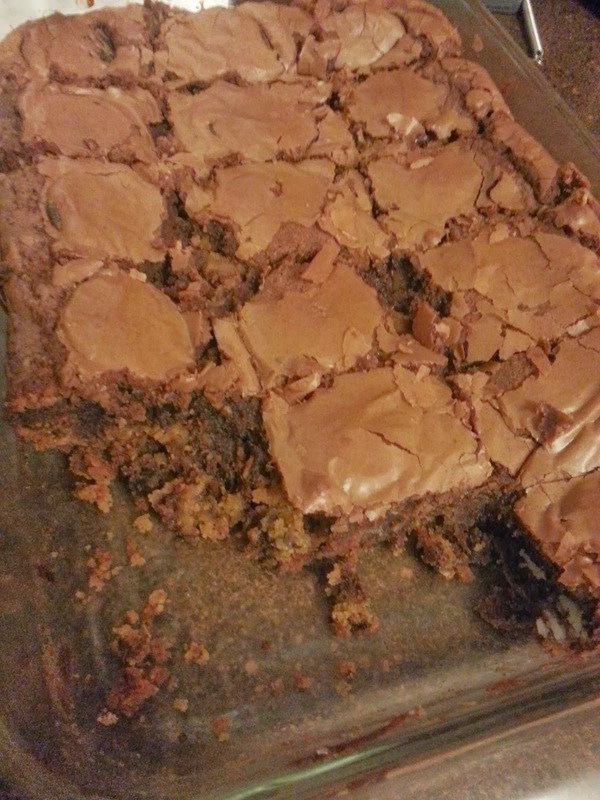 Oh, and these brownies my cousin made: chocolate chip cookie + oreos + brownies. Eric had to remove them from our home. I'm just glad she brought them over after my glucose test! ha! Food aversions: Well, I ate pork chops last week, however, I was not able to cook them...bleh. 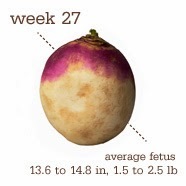 What I am looking forward to: Sharing our little girl's name with everyone! 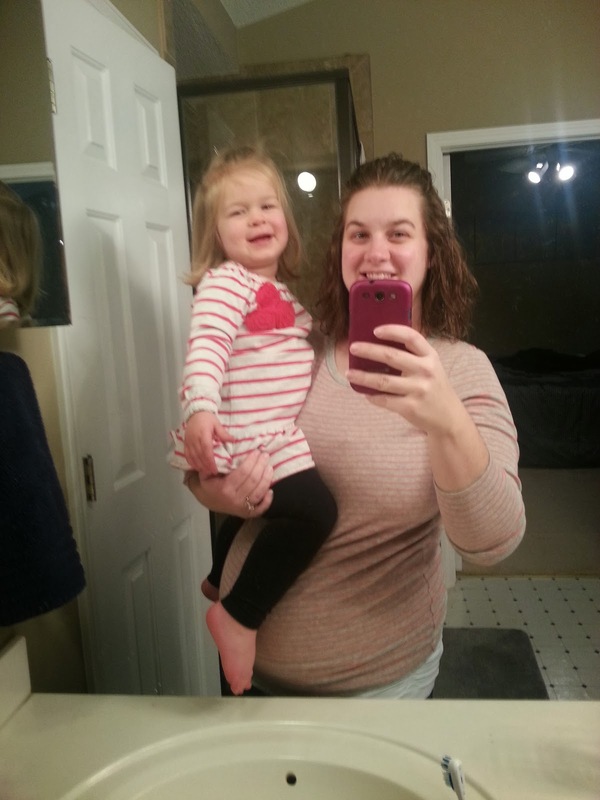 Milestones: I passed my post-prandial glucose test! Say What? In line for the bathroom at a coffee shop the lady in front of me turns around and asked, "Hey, you're not having one of those crazy-hafa-pee pregnant lady moments or can I zip in real quick?" Sweet moments: Handing me the doppler the other morning Evie asked, "Hey Mama, can we listen to sister's heartbeat?"Oh-kay. Make room for baby: I am getting really anxious to get the cradle set up, and her clothes and blankies washed, but I am forcing myself to finish the heavy lifting projects in the next six weeks and to save the wash and organize stuff for the last six weeks. Oh, and THIS: I talked to the midwife and she approved my friend potentially observing our birth for her doula certification. Pretty excited about the possibility of having her there! I had slipped on a rug and sprained my inner thigh so badly I was on bed rest for a week; had some issues with this over Christmas and saw a therapist to get them worked out before they became debilitating. I'm glad I did, as I am fine now! Just decided to make a nursery in our apartment; putting the finishing touches on the big girl room so we can update the nursery for the new baby! Had gained 30ish pounds; gained 17ish pounds! 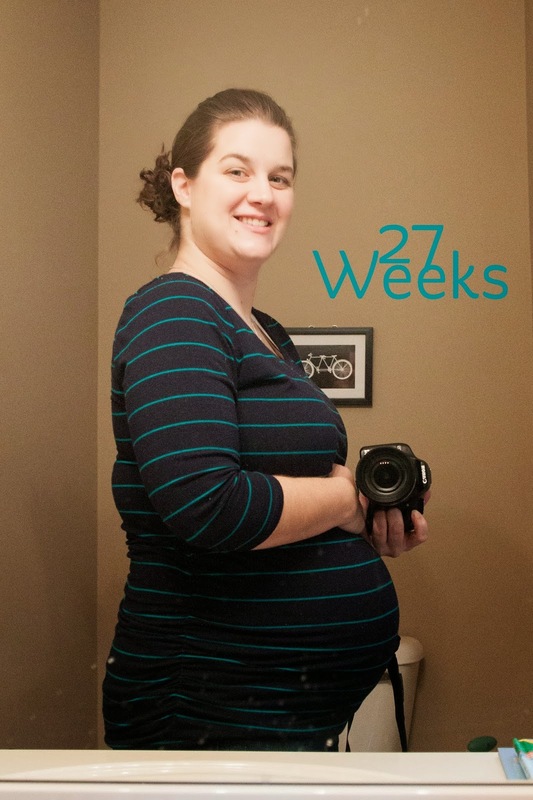 Read her 27-28 week update here! You look great! Love reading your updates to see what might be ahead in the next few weeks.